PG Commander requires OS X 10.8 or later. © 2013 Egger Apps e. U.
PG Commander has been discontinued and is no longer supported. Please have a look at its successor Postico. Fixed host key checking when connecting to an SSH server. Fixed a possible crash when loading database contents. Fixed an issue where PG Commander only showed some of the results in the SQL Terminal if downloading them took longer than approximately 50ms. Fixed an issue where only the first line of error messages was shown. Fixed an issue where the table icon grid didn't scroll on OS X 10.8. You can now connect via SSH servers that use keyboard-interactive instead of password authentication (eg. OS X). Additionally, PG Commander now supports connecting to servers that require multiple auth methods. Database icons are now smaller to waste less space. Fixed an issue where connecting to ‘localhost’ sometimes failed. Addressed an issue where PG Commander would cause the discrete GPU to activate on some MacBooks. Deleting Materialized Views now works as expected. Added a warning when trying to connect via unix domain sockets. Removed support for authentication via client side SSL in the Mac App Store version. This feature was based on an exception to the app sandbox that Apple did not approve. If you need this feature, please email me. If there is sufficient demand, I might be able to implement client side SSL in a way that is compatible with app sandbox. PG Commander now jumps to page 1 when a filter is applied. Fixed a problem where PG Commander executed an incorrect query when the query text field was not in focus. Get back to work faster! When you open a table, PG Commander now remembers sort order, filters etc. from last time. Filters are now persistent: When you open a table, PG Commander remembers the filters you used last time. New Operators for text fields: ‘does not contain’, ‘is not exactly’. New Operators for numeric fields: ≠, <, >. Filtering columns that contain percent signs, underscores and backslashes now works as expected. Selecting ‘Custom SQL’ now autofills with the generated SQL of the filter. 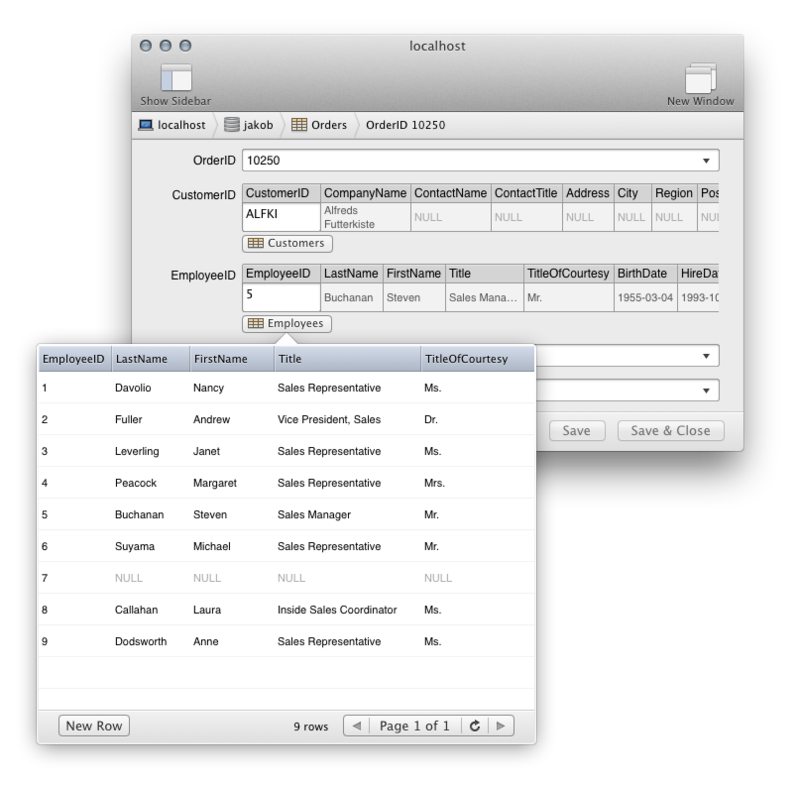 Export directly from the table view using the ‘Export…’ command in the File menu. When exporting from the table view with active filters, only filtered rows are exported. INTEGER and FLOAT types are now exported without quotes. Added an option to insert DEFAULT in Boolean columns. FLOAT: Insert special values like Not-A-Number and Infinity. DATE: Quickly insert todays date, or tomorrow, or yesterday. Fixed a problem where PG Commander may crash after closing an SSH connection. The favorites window now closes automatically after establishing a connection. Upgraded to OpenSSL 1.0.1h to avoid the most recently published vulnerabilities. Quickly find rows that contain a string. By default, all columns are searched, but you can restrict the filter to a specific column. Combine multiple filters to quickly perform complex queries, or provide a custom WHERE clause. Quickly copy rows from a table or from a query result as CSV or as SQL INSERT statements. There are three new buttons by default: a back button, a forward button and a button to quickly open the terminal. Moreover, you can now customize the toolbar (right click) to add an optional up button and a reload button. Sorry for messing with your muscle memory, but I think these choices are better in the long term. I also added a few tooltips to make keyboard shortcuts more discoverable (eg. ⌘↩︎ to execute a query). Materialized Views are now also supported in PG Commander. They show up alongside tables & normal views in a green color. Removed unnecessary plain text warning when connecting to 127.0.0.1. Previously, PG Commander only reloaded the currently active view when you hit ⌘R. Now PG Commander reloads the currently active view and the sidebar, and it purges cached views. This should make it behave a lot more intuitively. Fixed a problem when connecting to a SSH server for the first time. Finally! Connect to PostgreSQL servers behind firewalls with the included SSH tunnel support. Both password authentication and public/private key based authentication to the SSH server are supported. Instead of providing a checkbox, PG Commander now requires SSL by default. If the server doesn't support encrypted connections, PG Commander will show a warning. You can now show a list of all databases on the server when connecting. Select the table and hit ⌘⌫ or right click on a table to bring up the context menu. Animations in the favorites window are now smoother. Default connection parameters are shown as placeholders. Toolbar can now be hidden. Scrolling tables horizontally with the trackpad/magic mouse doesn't get stuck anymore. Fixed a problem where passwords sometimes weren't saved in the keychain. PG Commander is now more robust when the server sends invalid UTF-8. Changed keyboard shortcut for new row to ⌘⇧N to avoid conflict with ‘New Window’ shortcut ⌘N. Now compatible with Amazon Redshift. Showing / hiding the sidebar is now permanent. Connection attempts can now be cancelled. Added a menu item (and the shortcut ⌘N) for the "New Window" command. Fixed a crash when using the context menu in SQL Terminal. The SQL Terminal now remembers executed queries. Use ⌘⎇← and ⌘⎇→ to move backward and forward through recently executed queries. In SQL Terminal, there are now now buttons to load queries from text files, and to save them. You can now choose to encrypt the password when exporting favorites. Executing a query in SQL Terminal no longer clears the undo buffer. This makes it much more convenient to fiddle with complex queries. I have improved the layout code to avoid frequent jitters during scrolling. Also, Mavericks responsive scrolling is now disabled because it doesn't work with nested table views. When checking for updates, PG Commander now uses an SSL connection to ensure updates are only published by Egger Apps. Documentation PG Commander now includes documentation for the most important features. Context Menu Right clicking on items in the sidebar now brings up a context menu that allows you to quickly open them in a new window. Nicknames Favorites in PG Commander can now have nicknames! This allows you to distinguish between multiple databases on the same host. It's also great when your database has a cryptic hostname (like on AWS). Automatic Update Checking PG Commander now automatically checks for updates, and shows a subtle notification in the favorites window when a new version is available for download. You can disable automatic update checking in the preferences. Favorites Window In the wake of adding nicknames and update notifications, I tweaked the design of the favorites window. This release is all about the little things. Fixed layout issues when toggling the sidebar. Improved behavior of escape/enter key when editing foreign key fields. Added undo support when editing rows. Added keyboard shortcut Command-Return (⌘⏎) to save and close the row. Improved visual design to better match the rest of the app. Added Clear Display command to clear results of previous queries (⌘L). Added undo support in the query text field. Added keyboard shortcut Command-Return (⌘⏎) to execute the query. This beta fixes an issue where tables could not be viewed when connecting to PostgreSQL 9.0 and earlier. Awesome icon designed by Dave Brasgalla from the Iconfactory. Editing Tables with Foreign Keys: When a field has a foreign key constraint, PG Commander now shows the row from the foreign table. You can also directly pick a row from the foreign table from a popover. You can even quickly add a new row to the foreign table! There is now a preference setting for the number of rows loaded per page in the table view (default 1000). I started with writing the documentation. The first section is “Connecting to a PostgreSQL Server”. Only the current database appears in the sidebar by default. There is now a button to show all databases. This improves usability when connecting to a server with many databases. Errors when loading items in the sidebar are now properly reported.